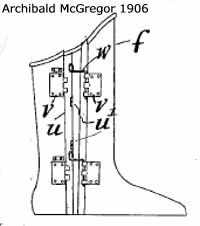 A patent taken out in 1906 by Archibald McGregor, of Queensland (Fig. 542), recalls that of Murray and Stuart, since it provides the diver with three separate dresses. In this case, however, an ordinary diving-dress goes on first and another similar dress last! Between the two are various separate pieces of armour, to fit trunk, arms, legs and feet, none of these being watertight. 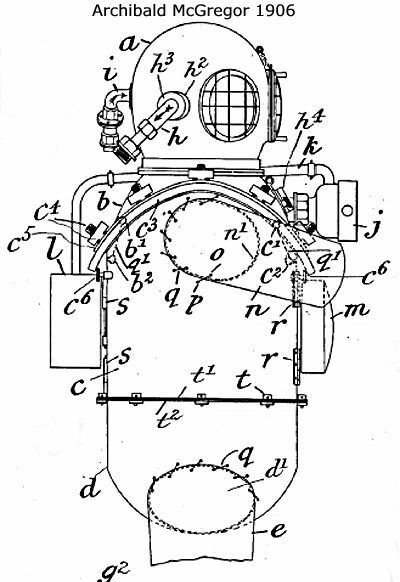 Twin-armoured air-pipes are fitted, and the diver is further provided with an enclosing cage of open grillwork— presumably to safeguard him from sharks! McGregor built a suit from 3 dresses. No new features in this invention. The suit was simular to the Murray and Stuart suit.